“Cut Bank” deserves more attention. 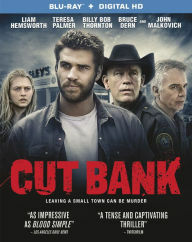 Set in the small town of Cut Bank, Montana, the aptly named “Cut Bank” is an ensemble crime thriller that begins with a postman (Georgie) allegedly being murdered. Since the murder was caught on camera by a young man (Dwayne) who was filming his girlfriend (Cassandra), an investigation into this heinous crime is opened. Alas, this murder isn’t so cut and dry as the mystery deepens as the film progresses. To make matters even more complicated, an unstable and eccentric man (Derby) waiting on a package that was presumably lost amidst the murder sets out to try and find it on his own. Did the murder actually take place and will there be some sort of fallout from it? Is there a larger scheme going on? Was the murder a set-up for someone or something? I’m not spoiling anything! Considering how much junk hits the big screen on a monthly basis, it is shocking that “Cut Bank” did not receive a sizable theatrical release. Not only is it an involving thriller that is absolutely worth seeing (give or take a few frustrating plot devices), but it also boasts an incredible cast (Billy Bob Thornton, Michael Stuhlbarg, Bruce Dern, John Malkovich, Liam Hemsworth, Oliver Platt, and Teresa Palmer) that is on their A game. While I can heap praise on each cast member here, it is Michael Stuhlbarg and John Malkovich who steal the show. Stuhlbarg (best known for “A Serious Man” and “Boardwalk Empire”) may not be a household name, but he is scary good here as the creepy Derby. As for John Malkovich, he shines as the local Sheriff. Over the years, Malkovich has turned in some over-the-top or lazy performances, but he’s fully committed here as an honest Sheriff with a weak stomach. Presentation: 2.40:1 1080p. How does it look? “Cut Bank” looks superb in hi-def. Audio Track: 5.1 DTS-HD MA. How does it sound? I didn’t detect any issues with this track. It does the job. * 3 deleted scenes and 2 extended scenes. * A passionate commentary by director Matt Shakman and writer Roberto Patino. Overall Thoughts: Sure, “Cut Bank” is reminiscent of films such as “Fargo” and “A Simple Plan,” but the excellent cast and the plot twists will have you glued to the screen.